(Probably) Graf Emanuel Andrássy, Budapest, 1884. 1913 Bath House Inventory, p. 30, no. 159, in the Red Room, in the 'large glazed case near door - Middle Division'. 1914 Wernher Inventory, p. 30, no. 151. M. Rosenberg Der Goldschmiede Merkzeichen, Frankfurt 1922, III, no. 726, e. (probably), attributing this maker's mark to either Mattheus or Markus Wolff giving working dates of 1685 to 1716. The maker's mark M over W is identified by H. Seling (Die Kunst der Augsburger Goldschmiede 1529-1868, Munich, III, no. 1671) as that of Marx Weinold, who died in 1700. Seling lists a number of animals including models of a cockerel, hare, and bear (op.cit., II, figs. 453, 457 and 458), all of which appear to date from the very end of this maker's life. A very similar mark, but with a pellet above and to the right of the M, is recorded on a beaker of 1710-12 and attributed to Marcus Wolf (Seling, op.cit. Supplement to III, no. 1817). 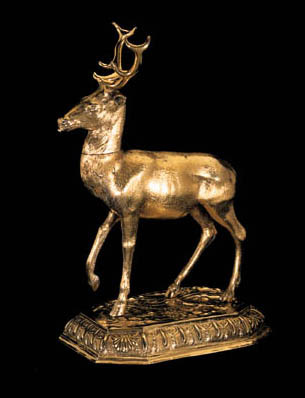 Stag-form cups, of all the various Augsburg animal form cups, appear to have continued to be the most popular well into the mid-eighteenth century (e.g. an example by Johann Wilhelm Dammann, 1749-1751, illustrated by Seling, op. cit., II, no. 996).